Preheat oven to 350 degrees F. Place muffin pan in the oven while it is preheating. Whisk the eggs together in a large bowl until light and frothy, set aside. In a separate bowl, combine the flour and salt. Heat the milk in a small saucepan over medium heat until bubbles appear around edges and milk is steaming, do not boil. Slowly add the milk to the eggs while whisking constantly. Gently stir in the flour mixture. When oven is preheated, remove the muffin pan from the oven and, working quickly, spray with nonstick cooking spray. Pour the batter into the muffin pan, filling each cup all the way full. Top with a handful of cheese. Bake until puffed and golden, about 45-50 minutes. It is best not to open the oven door while baking, as the escaping heat may prevent the popovers from rising completely. Cool in the pan for a few minutes, then turn out onto a wire rack. 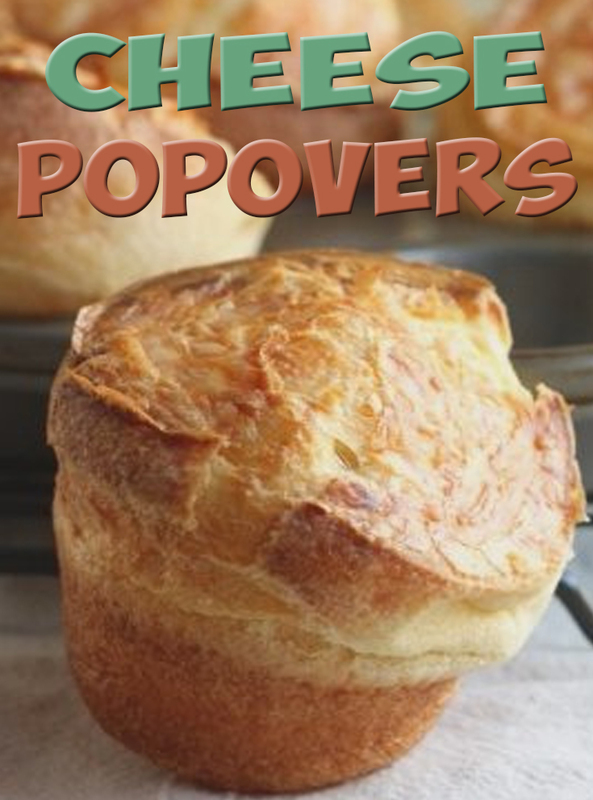 Popovers are best served immediately, but may be stored in an airtight container for up to 2 days. Reheat in a 400 degree oven for 10 minutes.